The object was very bright and seemed to have what I thought of as “sparks” coming from the trailing end, which was teardrop-shaped. It had a long, even, a white train of smoke trailing behind it, much like a thick contrail, which crossed the entire length of the sky. At times, the object's trailing edge became greenish in color, the leading edge yellow-orange, while the main body remained white. It seemed to pulse slowly several times, brightening with each pulse and I wondered if something else was going to happen to it. 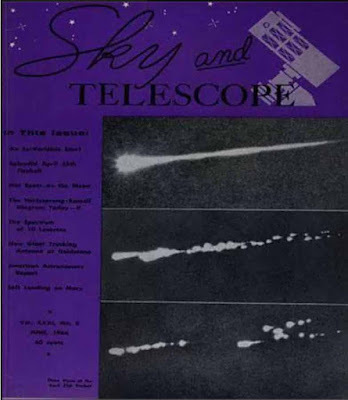 During these moments of brightening, the “sparks” separated from the main body and trailed it by at least two or three diameters. I remember thinking how strange it was that these sparks, or fragments, were detaching from the object and that they became visible only after they were some distance behind it. The fragments themselves alternated green and orange and left short trails of their own. I distinctly remember thinking that I couldn’t account for what it was I was seeing and I was especially boggled by the fragments trailing behind the object, seems to ignite only after they were some distance away. I wished that I could predict what was going to happen to the object next but I had had no similar prior experience with anything like this. I felt quite at a loss for an explanation for what I saw. Later that night, I had heard my mother on the phone, tell someone that there had been an announcement about the object on TV, about halfway through The Andy Griffith Show. I don’t know what channel it was or what the station call letters were. The object seemed to move perfectly parallel to the school rooftop, which was just a degree or two below the object, as it moved in a South to North direction. I was struck by the objects slow speed – about the speed of any plane I might have seen at the horizon at any other time. It seemed to take a long time to move across my entire field of view, which was clear all the way from the south to the north, except for the low school rooftop. The rooftop spanned almost the entire length of the western horizon but was itself only about five degrees in height and perfectly flat. I don’t remember hearing any sound at all. I remember thinking that the thing was going to explode at any time after it had swelled again and again. I remained quiet the whole time, not wanting to call out or call attention to the thing, but just watch and wait to see what was going to happen next. I don’t remember anyone else being around, anyway. Again, it seemed as if the event was endless and it struck me how the object seemed to go through many changes during its flight. I estimate the duration of the flight at about 30 seconds. Finally, it seemed to break apart completely and fade out just before disappearing below the tree line in the NNW. A similar, nearly identical incident occurred in the summer of 1979 or 1980, during the late afternoon (I don't remember the date), which I also witnessed while at work at Quickset Harbor. A similarly sized object had entered the atmosphere - I estimated somewhere over Maine or Nova Scotia - at the NNE tree line and disappeared over the Atlantic Ocean, at roughly the SE tree line. I was able to time the duration of this object's flight - or as much of it as I had witnessed - at 45 seconds. The object's train, speed, and its color approximated that of the 1966 incident. My sister, Linda, claimed to have seen the object while in a friend's boat on Vineyard Sound, just outside of Falmouth Harbor. I feel very lucky to have seen such rare and wonderful things. Almost three months after the 1966 incident, on Friday, July 1st, Barry and Binky’s band, “The Beau Brines” opened for “The Animals” at the Cape Cod a-Go-Go, in Yarmouth, MA. On Christmas of that same year, I received my second telescope, a 3-inch Newtonian reflector. It had a white cardboard tube with a screw-clamp ball-and-socket tripod mount. I saw the moon for the first time with this instrument. I also had a black-tubed 3-inch alt-azimuth reflector a year or two earlier, but other than burning my retina with it trying to locate the sun, I only remember using it to try to locate the moon. I didn't find the moon but I did find the sun! This was also the year that I got to sit in the pilot’s seat of John Glenn's Mercury space capsule, “Friendship 7”.